The St Catherine’s Bible Study group meets on a weekly basis to read, learn about, share their thoughts on, and take inspiration from the coming Sunday’s Gospel reading – and also for a mid-week meet-up over cups of tea and cake! We also like to meet for dinner several times a year. We’re a friendly group and are always happy to see new faces! You will find us at the Anglican Centre on Wednesday evenings from 7.30pm to 9pm. For the 2018 Lenten season the group decided to follow the five-week course offered as part of the Church of England’s ‘Live Lent – Let Your Let Shine’ campaign. 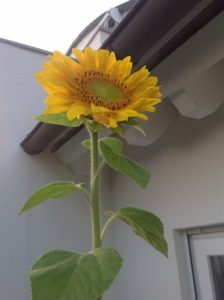 On one evening, we invited people to each plant a sunflower seed in a small pot. This was to remind them of their calling to nurture and pray for life in every situation they encounter, as well as of the beauty of fellowship and community, and the results were impressive (see photo)! Our focus during the twelve days of Christmas 2018 will be the Church of England’s ‘Follow the Star’ devotional booklet. Double check the calendar that the group will be meeting this week.